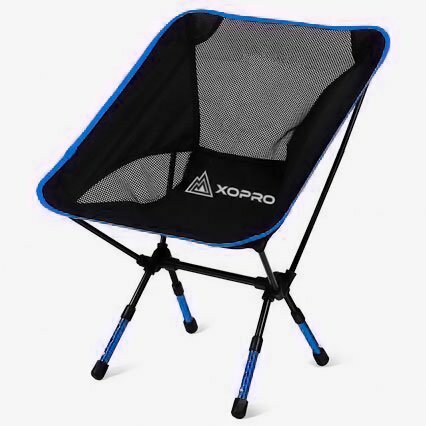 Choosing the best backpacking chair shouldn’t be difficult, whether it’s for hiking and it is light and easy to carry on the trails, has a mesh back to make a cool chair with optimized airflow, or just a small and ultralight seat that fits into your carry-on. The best of the best are a mix of lightweight materials, durability, portability, comfort, and ease of assembly. One of the better backpacking tips I can give you is that if you’re going to be roughing it, then you need an ultralight chair, along with minimizing the weight of your ruck. Weight matters, and if you carry too much, you’ll wear out quick. The best portable seat should bring you comfort at the end of a long day of hiking and trekking up and down and all around. It shouldn’t be something else to hassle with after dodging branches and overgrowth. That’s why we focus on ensuring that the products we have listed in our review are ultra-light, easily stowed away, optimizing comfort, and easily assembled and set-up on site. Difficulties on the trail are even bigger inconveniences and nuisances than if they were at home. This is supposed to be a time of adventure and relaxation, not frustration and stress. Save yourself the time and hassle of looking for the best backpacking chair. We took the time to find them for you, so read on and find out for yourself what makes these some of the best backpacking and hiking chairs on the market. You won’t be disappointed, and who knows, you may even find what you’ve been needing your whole life, you just never knew it until now! What Makes a Great Backpacking Chair? A great backpacking chair is made by a combination of its being lightweight, an extremely portable and easy to break down design, an easy initial assembly, comfort you can get lost in, a tough, long-lasting durability, and the ability to support heavier individuals. Finding all of these qualities is a feat in itself, but we did our best to do just that! I’ve always heard hearsay about what’s what, but the best backpacking tip I have ever heard was that when going somewhere to backpack and hike, count ounces, not pounds. The lower, the better. That way you aren’t expending energy on heavy equipment. It all really does matter at the end of the day, especially in the heat. Light carry weight is an absolute must. If you’re hiking or backpacking, you don’t want to be lugging around a bulky and cumbersome chair that weighs you down and makes life difficult. 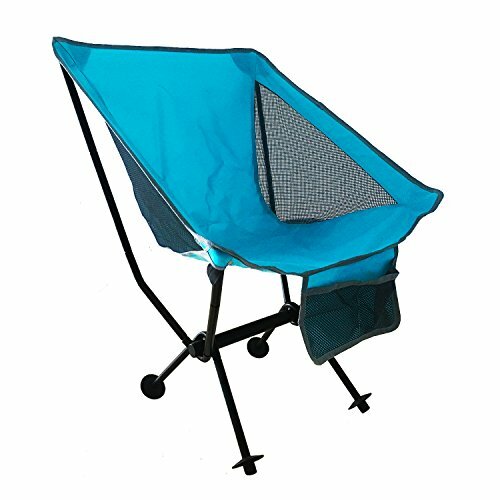 Not only does the best hiking chair need to be lightweight, but it needs to be portable, as well. If you get one that isn’t easily traveled with, then be prepared for workout lugging it around on your backpacking trip, or up and down the hiking trails. Portability is a must! After spending a long time on your feet, or a long time in the office, you just want to sit down, kick back, and relax. You want to let all your troubles and worries just melt away. If your chair is uncomfortable, you’re going to have a hard time doing that, what with the kinks in your back and the stiff muscles. Nobody wants to get to their destination, then have to fumble and fight with their seat before they get to sit down. Especially if they have been hiking or trekking all day, in the heat, and just want to relax. Let’s face it, even us big guys like to kick back and relax, even though we are usually busy working hard! When we do, we don’t want to worry about the seat ripping, or the legs bowing. The perfect backpacking chair allows the big guys and gals to relax, just as well as the smaller guys and gals. Nobody wants to spend money on something that is going to hold up to one trip and then take a crap. Sturdy, durable, long-lasting chairs are the name of the game whenever it comes to the best on the block. If your chair isn’t durable, then you’ve bought a dud and probably need to invest in a new one. With so many products constantly coming into and being removed from the market, someone can find themselves lost and feel hopeless when it comes to finding the best of anything and trusting that it is actually “The Best”. We’d have to give this review to the Oaken-Cat Lightweight Folding Backpacking Chair! When unfolded, it is about as tall as a standard table, but when folded entirely, it’s roughly the length of an adult forearm, unless you have short forearms, then you can’t be mad if what I said isn’t true, it’s your genetics, my friend. The metal legs are made of 7075 aerometal, which is known for its strength and durability. The fabric is made of 600D oxford cloth, combined with mess so that your back doesn’t sweat due to the lack of a breeze. There’s nothing worse than a sweaty back! It’s also roughly the same weight as a normal, everyday water bottle, all the while supporting up to 330lbs, and GET THIS! There is a full-warranty if it doesn’t live up to your expectations. Most folding chairs are uncomfortable, and just “blah”. Sitting in them for too long means a stiff back, stiff legs, and having to do the little rocking back and forth number to get out of the dang thing! One chair stood out above the rest, and that is the same one that made it in this review. Say “Hello” to none other than the Reliancer Portable Chair! The ergonomic design of these chairs means that when it comes to comfort, there’s no skimping here! The deeper bucket seat and improved back support make this chair the epitome of comfort! This chair even comes equipped with side-mesh to allow air flow on those hot and humid summer days! The Ultra-Light Chair by XOPRO is our pick for the “Best High-End” chair on the market. It only weighs 2.2lbs, but, like, it can, like, support up to 300lbs, man. That blew my mind, but everybody knows that you get what you pay for! XOPRO’s primary prerogative with this chair was finding the highest quality and most durable material that was also the lightest. I know, I know. You won’t simply take my word for it, so here are some reviews! Both of them gave it Five-Star ratings on Amazon! We know how all people are and how many people would give a product five stars? I always give a product four stars, because there’s no such thing as perfect, am I right? Check these reviews out and let the product speak for itself! Tsunamiscott said “Initially I was hesitant to purchase this chair because I had concerns about the quality. But after I opened the package and set the chair up the first time those concerns flew right out the window. This chair is very well made and the quality of the materials used is excellent. I’m really happy I decided to give the Terralite a try. This chair is easy to set up, it holds a lot of weight and it’s very comfortable. Also, the Terralite chair comes with Terrafeet to keep the legs from sinking into mud and sand. 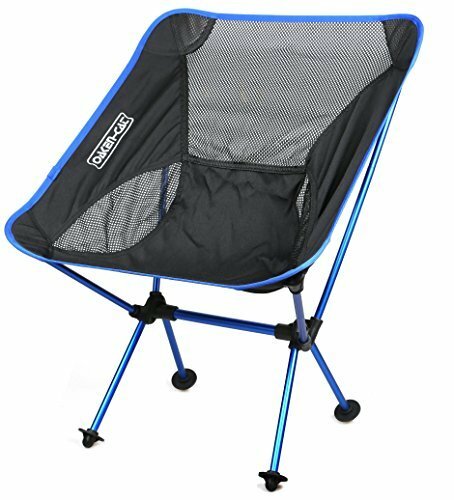 If you’re thinking about getting a portable chair, you won’t be disappointed with the Terralite. I would definitely purchase this chair again. Hope this helps.” And added five stars with that statement! Shoosky said “Wildhorn Outfitters built a solid chair! It holds its own against a well-known competitor brand (REI) as shown in this video. I am an intermediate backpacker and have often been frustrated by the feet of my tripod stool and chair sinking into the rain-soaked ground of the high Uinta mountains in Utah. This chair meets that problem head-on. The chair supports more weight, doesn’t sink in the sand, and is cheaper than the competitor brand in the video by about twenty bucks! The feet are a little heavy, but if you want a comfortable, no-hassle seat next to a lake or fire in the rain-soaked mountains, it is worth the extra weight!” Guess how many stars shoosky gave the chair! Yeah, five stars! KingCamp’s Low Folding Chair would have to be the chair for this category. It comes in cheaper than the rest of the chairs but is also a comfortable, sturdy, lightweight alternative to the costlier alternatives. This chair comes with sturdy, swooping armrests, a mesh back to ensure airflow and a large cup holder for those leisurely days where you just want to sit back and relax. 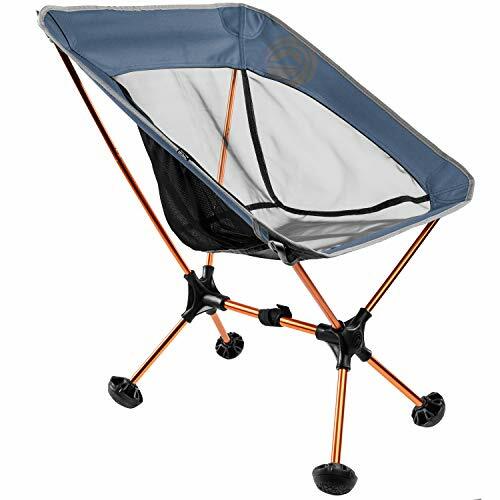 Check the KingCamp Low Folding Chair’s reviews out! You’ll have to take it apart and remove the fabric, but yes, they are all washable. That’s if you want to disassemble, then reassemble the chairs. Does it have any kind of warranty? Some of the chairs have warranties, such as the Oaken-Cat Lightweight Folding Backpacking Chair. Some of the other chairs do not have any kind of warranty, whatsoever. This is something to contemplate when researching which chair you want to buy. Can I use it with a folding table and a laptop? Again, this really just depends on which chair you purchase. 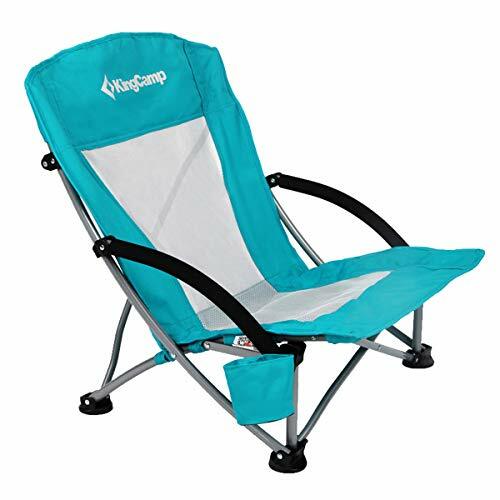 Some, such as the KingCamp Low Folding Chair, are simply built to lounge in and sit low, so it wouldn’t be feasible to use this chair for sitting at a table. What is the bag size? None of the travel bags are much bigger than an umbrella carry-bag. Will it support a 300lbs man? All of the chairs mentioned above have AT LEAST a 300lbs support capacity. Some of them even have a 350lbs (e.g. Terralite Portable Chair) to 400lbs limit, so, yes. How high is the chair from the ground? Some of the chairs are designed to sit low to the ground, while others are designed to sit higher from the ground. It’s all in which chair you choose to purchase, so do your research! Does it have any back support? The Reliancer Portable Chair has back support that is improved past a lot of the other chairs on the market, so maybe that is one chair to be looked at. I’m sure there are other chairs out there with back support, but the Reliancer Portable Chair is our choice!